Ancient parts, especially ancient cores and giant ancient cores, are used in Breath of the Wild for crafting ancient weapons and arrows, and for upgrading the game’s powerful ancient armour. This post describes some easy locations that consistently provide the best drops of ancient parts, including drops of multiple cores. 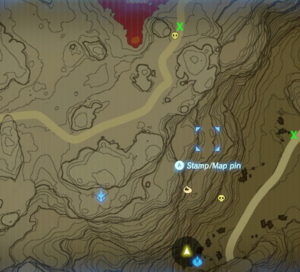 The best places to farm these are the Major Test of Strength shrines – there are 8 of these in the game not including the DLC. The drop rate is around 50% so you’ll average 4 ancient cores if you go around them all each blood moon. These guardian scouts also drop great weapons such as the Ancient Battle Axe ++, which are not very durable but are very powerful when used in conjunction with the ancient armour. The downside is that they do not drop giant ancient cores – plus you have to learn to defeat them (although they are very predictable once you’ve done it a few times). These are dropped by guardian stalkers but the best source seems to be the flying guardians. 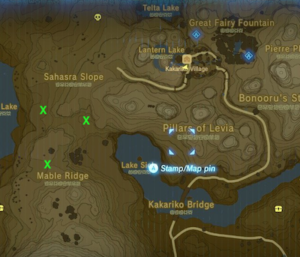 The downside with the flying guardians is that they can be tricky to defeat and many are in locations where the dropped parts are hard to retrieve. Check out Farming giant ancient cores for a method and location where this is comparatively easy. Kakariko between Sahasra Slope and Mable Ridge. You can get there from the village or by gliding down from the Shee Venath shrine. There are 3 stalkers close to each other but it’s easy to target them individually without the others attacking you. The large green crosses show approximate positions of the stalkers: I once had one of these stalkers drop 1 ancient core plus 1 giant ancient core. 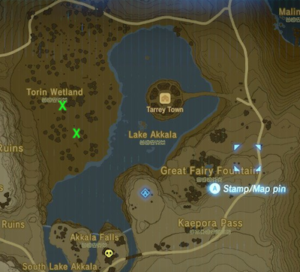 Torin Wetland: there are two guardian stalkers (and a disabled one) on the western shore of Lake Akkala – you can get there by gliding down from Tarrey Town or from the Dah Hesho shrine. This video clip shows an easy kill in Torin Wetland using a multi-shot bow and ancient arrows – the drop from this one stalker included 1 ancient core and 1 giant ancient core. I’ve had the same drop at least 3 times in this area. Eldin: Glide down from the Eldin Tower for an easy kill on the higher part of the road, then glide down to the road below for another. The lower stalker is sometimes concealed beneath the arch across the road. I’ve had the stalker on the lower road drop 1 ancient core plus 1 giant ancient core at least twice. North Lomei Labyrinth: The stalker is at the back of the main floor area on the same level as the front entrance. 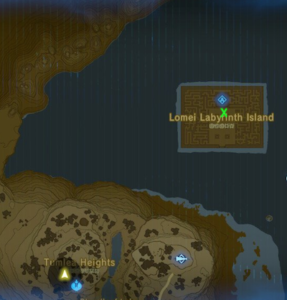 Drop directly down from the shrine in the labyrinth, or glide across from the mainland just behind the Akkala Tech Lab. If you start from the shrine, don’t drop down the hole which leads to the underground area with many decayed guardians. If you come in the front entrance, be aware that the stalker will quickly see you. This video clip shows an easy kill using a multi-shot bow and ancient arrows – the drop from this one stalker included 3 ancient cores. This is the only time I’ve ever had 3 cores from one stalker. I couldn’t believe my luck! 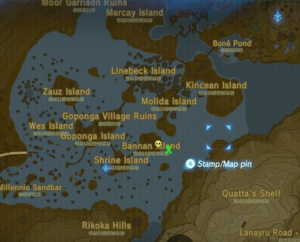 Lanayru Wetlands: You can glide down from Lanayru tower or from the Kakariko cemetery, or start from the Daka Tuss shrine (but you’ll need to dodge or defeat the lizalfos). The area is very flat but there’s a very convenient rock to give cover when you get close to the stalker. I’ve had this stalker drop 1 ancient core plus 1 giant ancient core several times. Maybe you have a different favourite spot for farming guardians for ancient parts…? This entry was posted in Breath of the Wild and tagged ancient core, botw, drop, farming, giant ancient core, guardian, stalker on November 27, 2018 by BotWander.